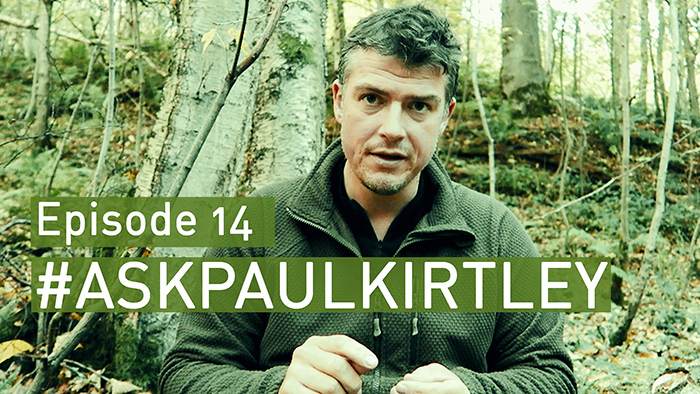 In this episode of #AskPaulKirtley I answer questions on toxic firewood, down sleeping bag cost vs weight, what to do if lost in the woods, what knife to carry, sharpening knives on coffee mugs, using contact lenses outdoors for extended periods, the minimum knowledge to be a bushcrafter and rewilding Britain. #AskPaulKirtley Question for the next one. – Do you think gamaschen or gaiters are useful in bushcraft ? – What books do you recommend for tracking ? – Can you tell us more about natural navigation ? After all the energy and CO2 put into their manufacture is added up you then have to account for the savings, in CO2, the turbines will generate over their lifetimes. I suspect it will be considerably more than the fixed amount a forested area can hold. It doesn’t mean other sites for the turbines that aren’t forested couldn’t have been used, but I’m not sure it’s as clear cut as you give the impression. For the record, I haven’t done the maths either, and I do love my local Forestry Commission woodland. Your comments about the skill level of a bushcraft instructor resonated with me, and I smiled when you said you thought that often what people taught was crap. I often visit multi activity centres while training ropes course stuff, where bushcraft is “on the menu” and quite frankly I think it’s there to pad out their activity list. When I ask what they teach it’s plain that it’s very basic and their instructors have very little knowledge or skill set. I recognise that often activities are used as a vehicle for transferable educational purposes – but often even these are missed. You mention other activities that are instructed in the outdoors, such as climbing and canoeing. Many such activities are sports in their own right, with National Governing Bodies, which in turn have their own recognised training, assessments and qualifications. These clearly define the level of ability of the instructors as well as defined remit of what and where they can instruct. And then we have bushcraft… I know the IOL have a scheme in place to measure bushcraft instructors’ skills, but currently I’m unaware of anything that is nationally recognised. This is so similar to where the world of ropes courses were a few years ago. There was no nationally recognised qualifications, and still, to this day organisations run in-house training with folk coming out the other end calling themselves “ropes course instructors”. This has now slightly changed with the formation of the European Ropes Course Association, which has its published standards. So maybe there should be formed a “UK Bushcraft Association” made up of interested parties to look at standards for instructors? P.S. On a personal note, I lost all my contacts on my phone recently, including yours, so PM me on FB when you get the chance. Another great lesson. I really love your passion for the enviroment! Great to hear you tell it like it is. Just checking in … Great article … Really liked the re wilding views. Spent quite a bit of time in reserves in South Africa working with animals, and with the lodges, I think it can be done here in a similar way all be it a more controlled way from the outset by dedicating huge areas including the more predatory species like wolves and bear, and by making visitors passing through these regions aware of the possibility of encountering these species in the wild. Similar to the game reserves in Africa which are in some cases quite vast. This might also be a key to re planting and regenerating the country as we are inclined to destroy the natural habitat of so many of our endangered species, to make way for new development. Our government and sometimes the local authorities are often the ones to blame for poor decisions usually based on financial gain or simply lack of environmental knowellege so to speak. Anyways … Great article … Thank you for sharing your knowellege with everyone freely, and for giving sound structured advice, dispelling the many fakers out there ! Haven’t watched this episode yet but wanted to let you know where and how I watch your show (you’ve asked previously). As I catch the bus to and from work and the internet isn’t so flash I download the video to my phone. To do that I get the YouTube link and then use a website to download the content. Many thanks for all your hard work, I’ll ask some questions soon. It’s coming up to winter camping season and I’ve got a trip in Skye planned. Hi Paul. Just found this and am really enjoying it. I have been using wet or dry sandpaper to sharpen my tools for quite a few years now. A quarter sheet lasts a long time and I find that 400 1000 and 2000 are more than enough to go from a nicked blade to a mirror polish. For a couple bucks and a few grams it can’t be beat. Thanks for all the great content! I really find your podcasts very informative and knowledgeable and i watch them all. The STOP and PLAN articles are good core skills to learn. Keep up your good work. Great you cleary explain what to do when lost in the outdoors. technical point on this page: the soundcloud is in the slot for the video and vice-versa. this means looking at this episode needs to be done in small size. Odd…. A second refresh (caused by sending the previous remark fixed the layout of both streams). I am happy with this, though you might have some troubles to find the cause (not so straight forward as a mix-up 🙁 ) and i don’t have debugging info to help you. Sounds like the result of an iframe quirk of a slow loading browswer.